A protein skimmer or foam fractionator is a device used mostly in saltwater aquariaum to remove organic compounds from the water before they break down into nitrogenous waste. Protein skimming is the only form of aquarium filtration that physically removes organic compounds before they begin to decompose, lightening the load on the biological filter and improving the water's redox potential. As an extension of aquarium work, we got into designing acrylic accessories for water filtration. We make our own large volume protein skimmers and denitrators which are suitable for marine aquariums of the size upto 25, 000 ltrs. We also make bigger units besides installing multiple units for larger marine aquariums. 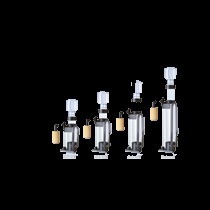 Being one of the prominent organizations, we are involved in offering a wide range of Protein Skimmer. These are finely processed using advance technology and as per world class standards. Our products are acclaimed for their best craftsmanship and reliability. These are available with us at market leading rates. This product is designed for reducing nitrate of aquarium, inside place high-quality bactoball & aqua medic deniballs.